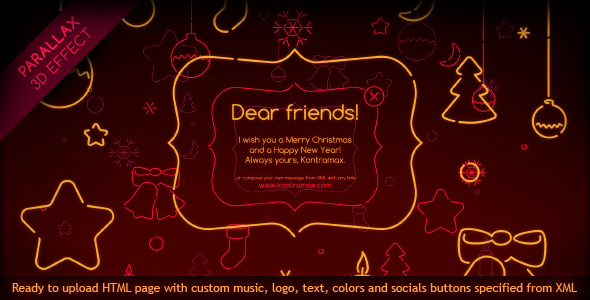 Complete animated and sounded Christmas e-card with interactive open/close button and neon glowing xmas style objects with 3D parallax effect depends of mouse moving. All vectors. Ready to upload HTML page template with XML custom external logo, music, social share buttons, adjustable multiline textblock, fullscreen and mute buttons. Animation centered in browser window and can be scaled and repositioned via XML. Also complete music loop from this e-card you can get here on AudioJungle! - You can on and off neon animation. 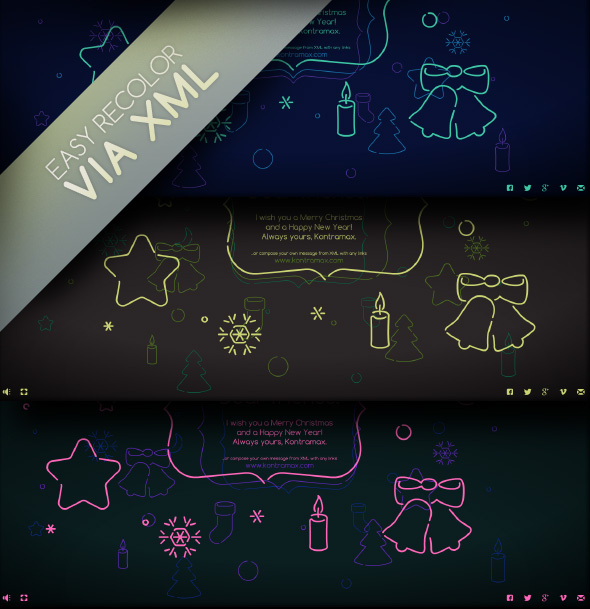 - Many settings via XML, very easy to use, you can change logo, music file, text, sizes, colors without recompile original .FLA file. - Original music loop included in archive for your future projects. - Music mute, fullscreen buttons, 5 popular customizable social share buttons. - Help file and well-commented XML file. - Due to many objects and parallax calculations, computers with good performance preferable. Hope you enjoy this file and please take a second to rate and share it!